I have found it a lot easier to carry water in one large container, than many small containers. Before I used to carry one-liter bottles, but the empty bottles filled my trash can. Also, with the truck sitting in the sun the small bottle heated up fast, but the 6 gal tank stays cool a lot longer. I could also put the water tank in an unused part of my bed. 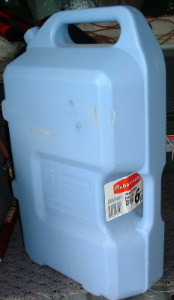 The Rubber Maid 6-gallon water jug fit neatly in my truck bed just to the front on the wheel-well. Next I found a small 12-volt pump at an RV supply store. 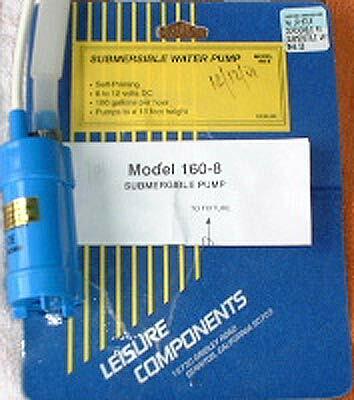 I used a submersible pump so I would not have to cut a hole in the bottom of my tank. A fitting hole in the bottom of my tank could leak from bouncing around off-highway and pour 6 gals of water into my truck bed and get my gear wet and I would not have drinking water. I had first tried a hand pump, but they are hard to find and the one I did find was a Cheap-o and broke after a couple trips. Next, I needed a watertight way to run hose and wire into the tank. I used the pour spout opening. I put a ½ NPT thread into a stainless washer that was the size on the pour spout opening. I then removed the rubber o-ring from the Rubber Maid spout and installed it on the stainless washer. I threaded a 6" pipe into the washer and ran the pump wire and hose thru the pipe. I used electrical heat shrink to seal the top end of the ½" pipe.